If you’ve never been to Dallas, you might imagine barbeque, the Cowboys, and oil money. But with over 1.2 million people, the 3rd largest city in Texas has far more to offer than that. And for the most part, Dallas makes it easy on visitors when it comes to finding their personal tastes. The city is split into over a dozen different districts, each with its own flavor. Continue reading to learn about some of the best. Many people don’t realize that Dallas has one of the best scenes for art, not just in Texas, but the entire country. Covering over 19 blocks, the Art District has almost 70 acres of eclectic offerings. The area is actually the focus of a 30 year plan that has so far seen 4 separate buildings built by Pritzker Prize awarded architects. It’s also home to the AT&T Performing Arts Center, the Meyerson Symphony Center, and the Dallas Museum of Art, which sits at its heart. No matter what kind of art you enjoy, this district is worth your time. Once an area known for its industrial work, Deep Ellum is now the go-to for live music. While the area is often credited with being the birthplace of blues and jazz, nowadays you’re just as likely to hear hip-hop and rock ‘n’ roll bouncing off buildings in this district. Deep Ellum has been compared by many to New Orleans and New York’s SoHo, in terms of its rich and native art. The area is home to a number of festivals throughout the year. There’s more than just music to be found there. Visitors can enjoy all kinds of restaurants, as well as stores that sell unique works of art, jewelry, and clothing. Known by locals as the “Beverly Hills of Texas”, Highland Park is definitely a far cry from some of the more rustic parts of Dallas. That’s not to say there isn’t plenty of unique character to be enjoyed in this district. If you like fine dining and upscale shopping, you won’t want to miss Highland Park. A popular attraction is Highland Park Village. The Spanish Mediterranean shopping complex features boutiques like Chanel, Jimmy Choo, and others that would make it revered amongst some of the world’s best designers and pickiest shoppers. Any sports fan traveling to Dallas must visit the Victory Park district. It hosts the American Airlines Center, home to both the Dallas Mavericks and the Dallas Stars. Of course, there is plenty else to be enjoyed. You can visit a wide range of restaurants, bars, and shops. 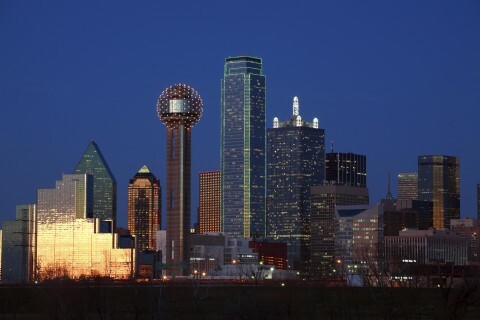 Dallas’ famous Ghostbar is located in Victory Park, as well as other fun hotspots like the Hard Rock Café, the House of Blues, and the W Hotel. Keep in mind that there are still 9 other districts in Dallas to explore, each with its own unique character. You could easily spend an entire year enjoying just one of them. So, while many might know Dallas for just one thing, the truth is it offers an eclectic collection of attractions.